1996: New Deal releases New Deal Office 2.5, which was formerly PC-GEOS. IBM Releases OS/2 Warp 4 with a significant facelift for the Workplace Shell. 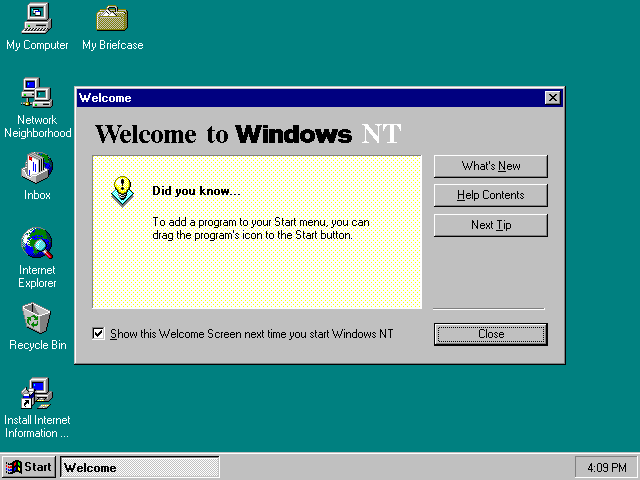 Microsoft releases Windows NT 4.0 with the same user interface as Windows 95. July 1997: Mac OS 8 is finally released. Selling 1.25 million copies in less than 2 weeks, it becomes the best-selling software in that period. June 25, 1998: Microsoft releases Windows 98. Features: Internet Explorer Web browser application takes over the role of the Windows shell, advertising right on the desktop, entire help system replaced by Internet Explorer. 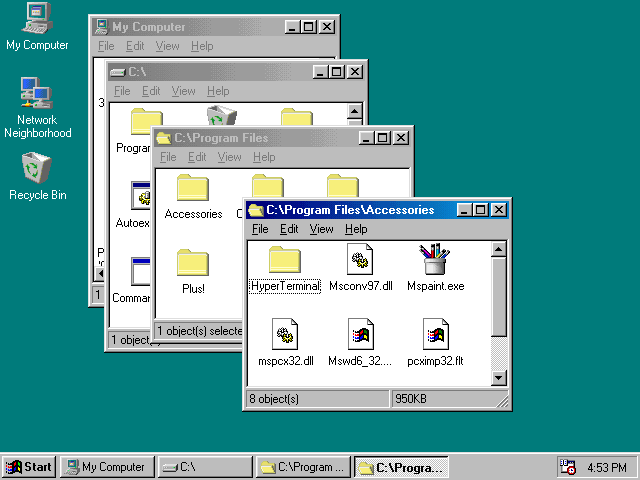 Features: A very Windows 9x like environment for Linux. November 22, 1998: Shane Brooks Releases 98Lite, an installer that removes or prevents the installation of Internet Explorer with Windows 98. Features No Internet Explorer or advertising, all the hardware support of Windows 98, faster boot time, and the more responsive Windows 95 shell. March 3, 1999: GNOME 1.0 released. March 1999 - Apple releases Mac OS X Server, a Unix based OS with their Macintosh GUI. June 1999 - RISCOS Ltd releases RISC OS 4 for RiscPC, A7000 or A7000+ machines. 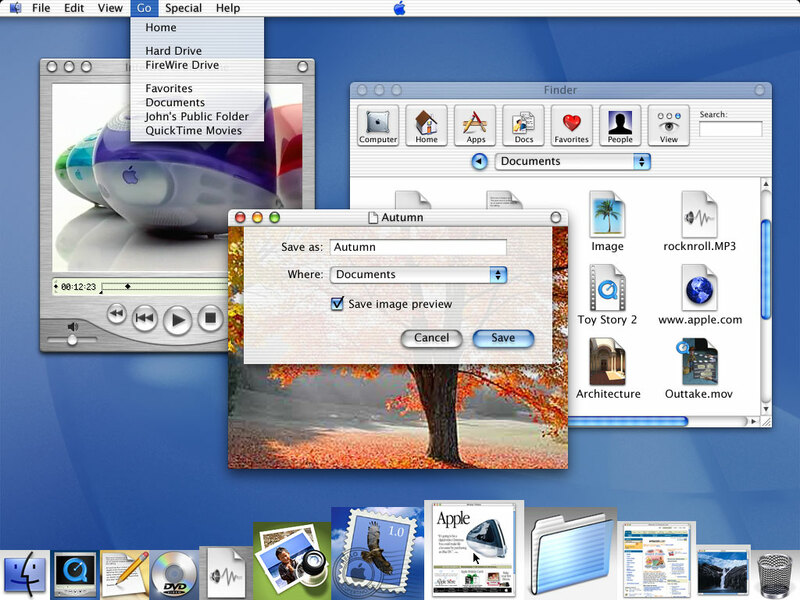 January 5, 2000: Apple announces Aqua, the new look for their upcoming MacOS X client. February 17, 2000: Microsoft Windows 2000 (AKA Windows NT 5) becomes available in stores. 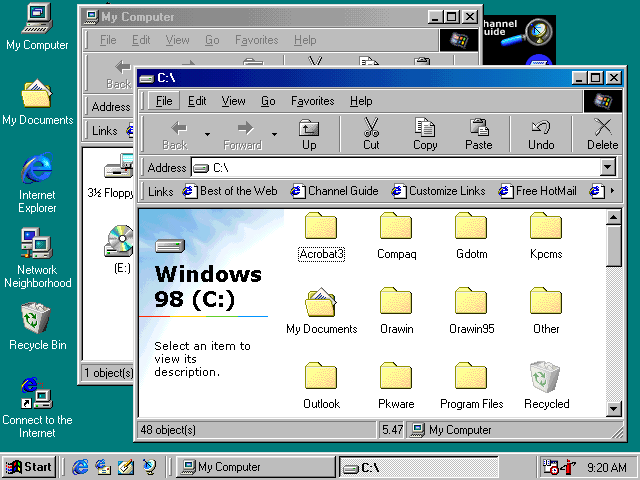 Features: The Internet Explorer web browser application finally takes over the Windows NT UI. "Product Activation" tethers XP to the existence of the Microsoft corporation. The dog from Microsoft Bob. 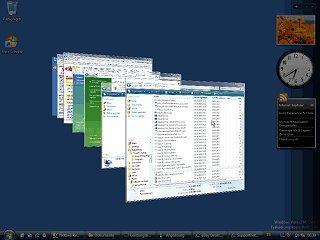 January 2004, ReactOS 0.2.0 is released. 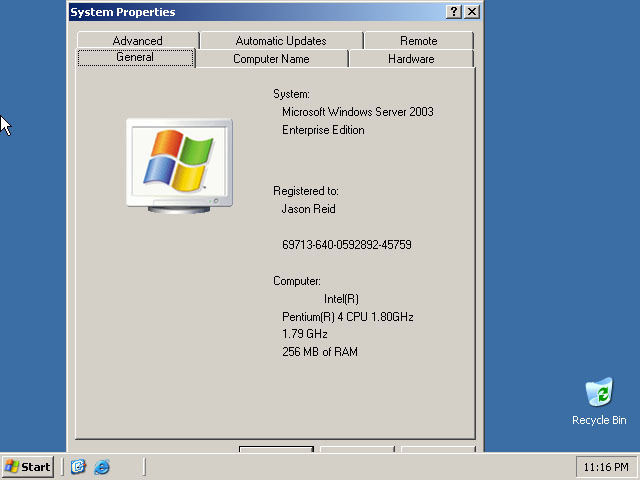 ReactOS is a 32-bit Windows clone and can even use Windows NT device drivers. 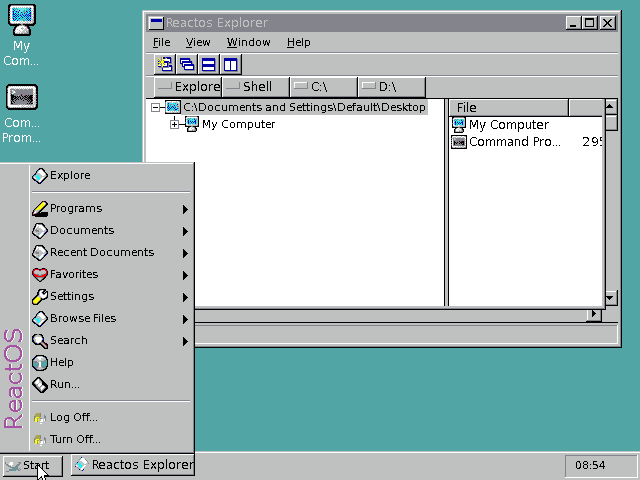 This is the first version to include its GUI shell - ReactOS Explorer. At this point ReactOS is still in early development and can only run very simple Windows applications such as Solitaire. Increased Digital Restrictions Management that tries to prevent playback or duplication of unlicensed audio and video material. The very next day Mooninites invade Boston, creating terror, bringing the city to a standstill, and costing millions of dollars in damage. Coincidence? I don't think so. July 2009. Windows 7 (NT 6.1) released - relatively little difference over Vista, but may be historically important as the last vaguely sane version of Windows. You can "pin" icons to the Taskbar. Ribbons replace menus in some applications. April 2011. Ubuntu releases 11.4 with it's new Unity interface. Launcher merges the role of the taskbar and the top panel's shortcuts. The Home Button and the "Dash" replace the Applications Menu. April 2011. Gnome 3 released, with a desktop that is similar to that of Unity. More huge icons that take up the entire screen. August 19, 2011: MATE released. 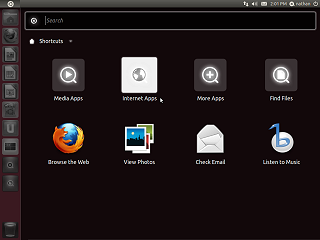 MATE is a fork of the GNOME 2 desktop that preserves the same user interface. August 2012. 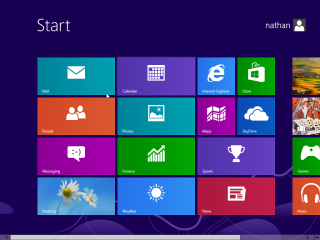 Microsoft releases Windows 8 (NT 6.2), placing a minimalist interface optimized for mobile devices over its Vista/7 desktop interface. "Apps" that you can only use if you have a Microsoft Live internet account. Heavily promotes impractical "touch" navigation of the UI on desktop systems. Removes the "Start" menu from the desktop mode. Other changes leave the desktop a confusing mix of UIs. 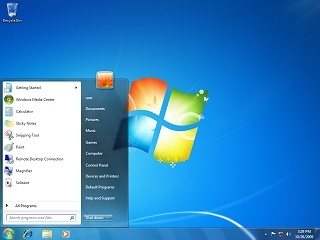 Windows 8 logo compliant computers require "SecureBoot" which creates a barrier to running any non Microsoft signed OSes. July 2015. 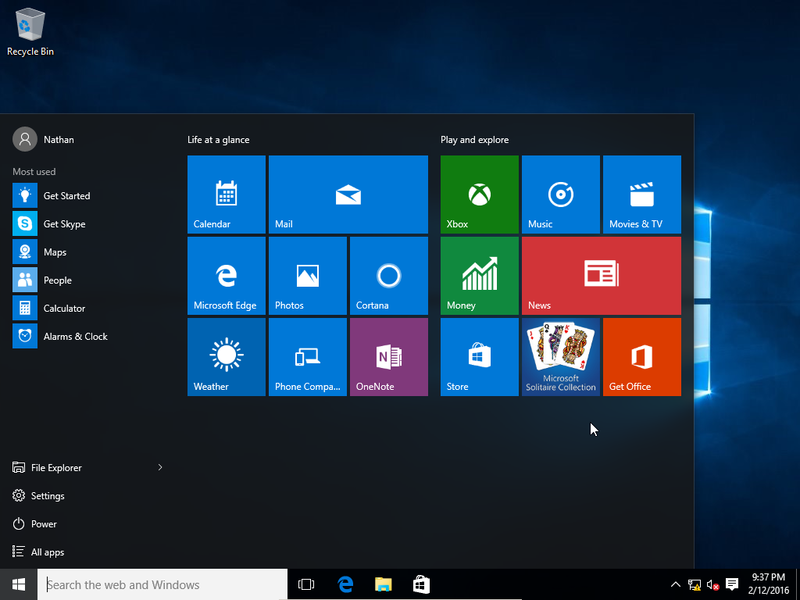 Microsoft releases Windows 10, mostly reverting back to a traditional desktop, and "Metro" app windows now overlap. The Start menu includes the contents of the Windows 8 Start Screen. Microsoft uses Windows 10 for advertising and bundles "telemetry" spyware. To get people to switch, they offer all Windows 7 and 8 users a free "upgrade" to Windows 10. I am limiting this timeline to systems that provide GUI services to other applications, this is why I am not including individual graphical DOS applications or older graphical programs such as Sketchpad. I am also not listing each version of a GUI system unless a significant change has occurred in it. MacOS has kept the same basic user interface since Version 1 and is therefore only mentioned a couple of times. Microsoft, on the other hand thinks it is fun to make users learn a completely new interface every few years, so each of the Windows interfaces is listed. (Except for Windows ME which looked just like Windows 98 and 2000). X could just about have its own history page. There is no way I can list all of the different appearances of X here so I am just mentioning its creation. The picture is much more recent and not of the original X. The picture of NextStep is of a later version. The picture of BeOS is from a later version. The color Mac screen shot is of MacOS 7.5.5, although these machines shipped with earlier versions. 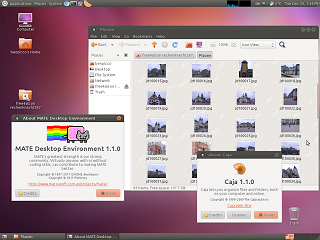 The Desqview/X screenshot is of a later version. I have insufficient information about the history of the Apollo workstation to place it on this timeline.